Uhg. It's not very fun to paint your nails during a heat wave. For some reason, when it's over 90 degree heat the last thing I want to do is sit in my room and paint my nails. I get so hot and sticky... and the paint takes forever to dry. But I did it for you anyways! I really want to keep on top of this challenge and not fall behind. So here you have the letter "L". I'm not going to lie, this wasn't my first idea for this letter. 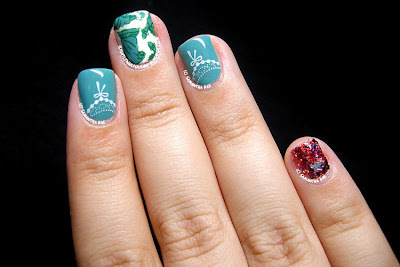 I was originally going to do Las Vegas nails, as I had a trip there in the middle of this month. But the trip snuck up on me and I ran out of time. Plus, my sketches weren't that good. 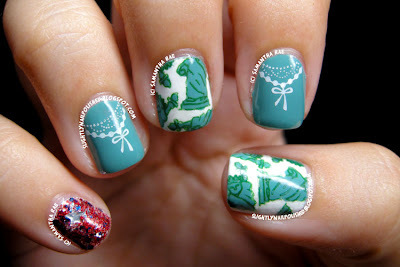 So with the 4th of July right around the corner, I decided to highlight a symbol of the holiday, Lady Liberty! All the polishes I used are listed below. 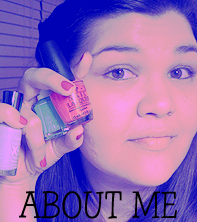 This design consisted of mostly Julep nail polishes, which is rare for me as I don't have that many in my collection. But something about Daphne by Julep that just screams Lady Liberty to me. I really like the glitter on my pinky (America by Julep) but, boy, is it a beast to apply. 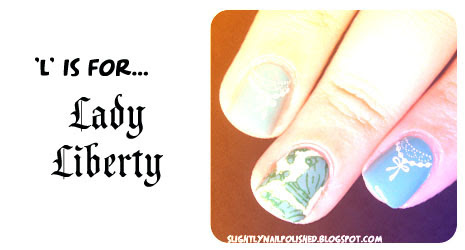 It's really thick and chunky and applies in blobs that you have to smear around your nail to get it to even. And those stars are a beast to fish out as you can't really see them in the bottle. Gick! But for some reason I still use it and I'm willing to play with it because I love the colors in the glitter. I made more of my home made stickers for this using my stamping plates. Those are fun and easy to apply. I don't think I will ever apply this design without filling it in and turning it into a sticker, lol. I hope you all like this design and that you have a great 4th of July. I'm planning on popping back in here once before the 4th to show you guys my holiday nails. But if this heatwave persists... uhg. Well, enjoy!